Joshua Landis writes: Assad’s Kurdish strategy appears to be to help the PKK to take control of the Kurdish regions of Syria in the North East. His aim is to hurt both the Free Syrian Army and Turkey, which are leading the opposition against him. In general, his strategy is to weaken the Sunni Arabs of Syria. On July 19, the Syrian Army withdrew from the town of Kobani followed by Efrin, Derik and Amuda as PYD forces swept in to take its place. Many claimed this peaceful transfer of power was orchestrated by the Assad regime and PYD leaders. There was no fighting and no casualties were incurred, according to the PYD , which said the party essentially issued an ultimatum that prompted Syrian government forces to withdraw from their positions. The PKK, masquerading as the Democratic Union Party (PYD), is the wing of the Kurdish movement that is most anti-Turkish and therefor anti-Free Syrian Army. 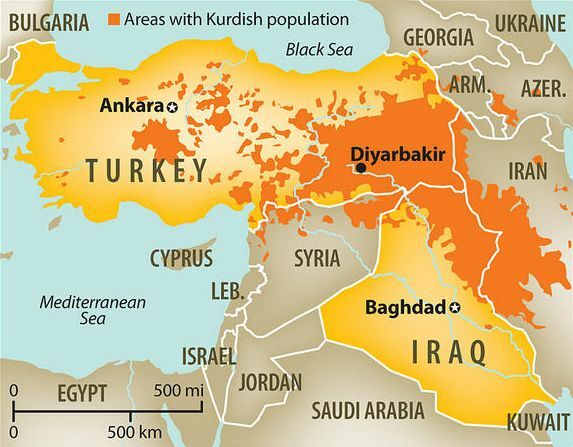 It is also vocally pan-Kurdish in contrast to many of the other Kurdish parties in Syria, which have positioned themselves, at least for the time-being, around the more limited goal of seeking Kurdish national rights enshrined in an autonomous region within Syria. The Kurdistan Workers’ Party is blamed by Turkish authorities for the death of 40,000 Turks and Kurds over the last several decades due to their separatist agenda and insurgent tactics. Because the PKK is better armed and more militant than other Kurdish groups, it has advantages because it is more prepared for war and the use of force. The Kurdish National Council (KNC) represents most of the Kurdish parties that oppose the PYD strategy. It is looking for an accommodation with the Free Syrian Army and Syrian opposition forces as a means to gaining national rights and freedom for Kurds. The KNC is a fractious coalition, that is not well armed or organized. The Kurdish parts of Syria will undoubtedly become the focus of the power struggle that is emerging in the region over Syria. Sunni Arabs and Turks will line up against it. Shiite forces will be inclined to encourage Kurdish independence if only to hurt the Sunni Arabs by playing minorities of every stripe against the against the FSA, Saudi Arabia, Turkey and the US. But what should the Kurds do? All Kurds are looking to take advantage of the collapse of central authority in Syria. They see this as an historic opportunity to press for their freedom and national rights. But how hard should they press and how fast? Should they work with Turkey against Assad or should they fight Turkey and ally with Assad? Is this a moment for caution or for audacity? Should they side with the Syrian opposition and Turkey against the Assad regime based on the notion that the Syrian revolt is about freedom versus dictatorship? Or should they side with Syria’s religious minorities against Sunni Arabs, based on the understanding that this uprising is largely sectarian. If this is the case, perhaps Kurds, being an ethnic minority, should stick with minorities in general against Sunni Arabs, who will present the greatest future obstacle to Kurdish ambitions? For decades the Assad regime has stood for Arab chauvinism and the denial of Kurdish national rights. Now that Assad and the Arab Baath Party are losing power, some Kurds calculate that the Free Syrian Army will inherit the banner of Arab Nationalism. Syria’s Kurds are understandably divided over how to pursue the struggle for Kurdish national rights and freedoms. The Syrian revolution is only in its infancy. The forces on the ground are changing with great speed to meet the challenges of the battlefield. Along with the emergence of new combatants and the transformation of the Syrian Army into an Alawite militia, ideologies are changing as rapidly as the faces of the leading fighters. Trying to keep up with the emerging forces in Syria is a full-time job. Kurds are having as much trouble picking their way through the dynamic battlefield and defining a strategy as everyone else. Their many factions are also fighting furiously among themselves for primacy in what many see as an emerging Kurdish state.